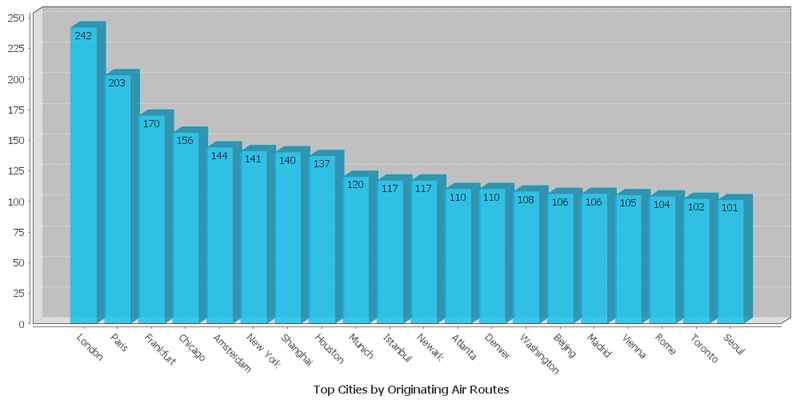 xAxisTitle: "Top Cities by Originating Air Routes"
This uses the same air routes dataset created in a previous example, with a simple grouped summary to show the 20 cities with the most air routes originating in them. JFreeChart is a bit notorious for being hard to use, but the JEQL command hides all the gory details behind a much simpler (but still powerful) Chart command interface. Currently Bar, XY, and Pie charts are supported. It will be easy to add other chart types as required. Also on the ToDo list is to provide an option to emit Google Chart URLs, using the same set of options (at least, the ones that are applicable - and maybe some new ones). Note: this is an experimental extension, which is not in a final state in the current JEQL release. Good news for those who wanted to try out the geodetic air routes JEQL script. The script requires JEQL version 0.9 to run. This version is now available for download.